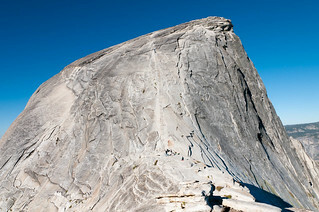 The cable route up Half Dome. We hiked to the top of Half Dome as a side trip while doing a 3 day/2 night backpack trip from Tuolumne Meadows to Happy Isles in the Yosemite Valley in Yosemite National Park, California. We camped at the junction of the JMT and Cloud's Rest Trail. We left camp at 3:30 AM and reached the top at 5:15 AM in time for sunrise. It was a bit disconcerting to cross Sub Dome and climb the cables in the dark but well worth it. We were first to the top and the cables were practically empty when we went down them at 9:00 AM.